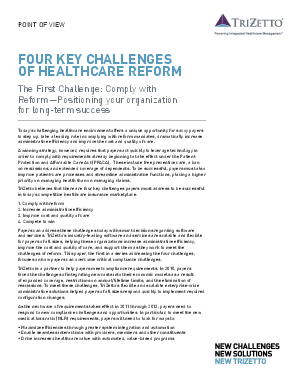 TriZetto believes that there are four key challenges payers must address to be successful in today's competitive healthcare insurance marketplace and provides its point-of-view regarding "Complying with Reform" in this article. Learn how to maximize efficiencies through greater system integration and automation, enable seamless interactions with providers, members and other constituents, and drive increased healthcare value with automated, value-based programs. Read on to find out how can position your organization for long-term success. DatacenterDynamics is a brand of DCD Group, a global B2B media and publishing company that develops products to help senior professionals in the world's most ICT dependent organizations make risk-based infrastructure and capacity decisions. Our portfolio of live events, online and print publishing, business intelligence and professional development brands are centred on the complexities of technology convergence. Operating in 42 different countries, we have developed a unique global knowledge and networking platform, which is trusted by over 30,000 ICT, engineering and technology professionals.